Date: WE 13:00 – 15:00, FR 10:00 – 12:00, starts 11.10.17! The lecture is intended for computer science students to get an insight into cultural heritage preservation and management techniques. 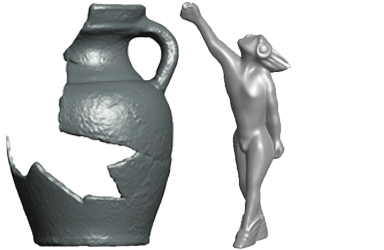 Examples of applications at excavations, museums, cultural heritage cites like churches and castles and artefacts found on CH sites are used to show the importance of state of the art techniques in CH preservation. 3D scanning and plotting for CH, 3D reconstruction and 3D surface modeling techniques including VR museum applications for CH, project studies and experiences, data organization and data exchange, planning of CH projects, high resolution multispectral imaging and will give an insight to all related fields in CH preservation like historic preservation, documents and archives, sites and monuments, living cultural heritage, and cultural property. Examples of such systems include On Site Reconstruction Experience, Multimodal Interface for Safe Presentation of Valuable Objects, Tools for Stratigraphic Data Recording, e-Tourism through Cultural Routes, Archaeological documentation for the Semantic Web, and Image-based Modeling to name a few. Time & place: The lecture is blocked on WE 13:00 – 15:00, FR 10:00 – 12:00, (starts 10.10.18!) in Sem 183/2. Registration: Please register at TUWIS online for this course.